This is one of those vivid childhood memories that made such an impression I remember it so well even thirty years later. I’m about six or seven years old, I suppose, on a scorching hot day at the house of friends of my older brother’s. They’re playing with Star Wars toys in the dust in the back yard, and for once I’m being allowed to join in for lack of other entertainment for me. I pick up a particular toy – a rough looking bounty hunter type with a helmet and a big staff. I pull at the helmet, it comes off, and to my little girl surprise, underneath are feminine features. I ask one of the boys who it is, and they tell me it is Princess Leia, dressed as Boushh the bounty hunter. A girl dressed as a boy? Doing boy things?! My young little mind is blown. And after that when we saw Return of the Jedi on TV, I was always utterly fascinated by that scene – the Princess, not being rescued, but being the rescuer (even if, OK, it did go wrong). The girl doing everything a boy can do. *although as I grew up, I of course discovered that it’s not ‘I can do anything a boy can’ but that ‘I should be able to do anything a boy can, but there are a hell of a lot of social barriers in the way’. **and that’s why we also need more people of colour, both male and female in our franchise and in our toy shops. We never talked about this on BABD so far, but there’s a significant discussion over supposed “empowerment” of Slave Leia and how this version of her should be celebrated as a Strong Female Character™, because she kills Jabba and breaks free while still in the metal bikini… to which we reply: Princess Leia is a strong character (as discussed in the post above), but Slave Leia is an outfit, not a version of a said character; particularly an outfit designed to humiliate her. She wasn’t awesome because she wore the gold bikini, she was awesome because she was brave and took the initiative when it presented itself! If anyone says it’s the bikini they’re a pervy liar! Carrie Fisher herself recalls how even though that scene was the highlight of her acting career, she’s not particularly fond of the iconic costume itself. This week’s throwback’s, of course, in honor of Carrie Fisher’s most iconic role. 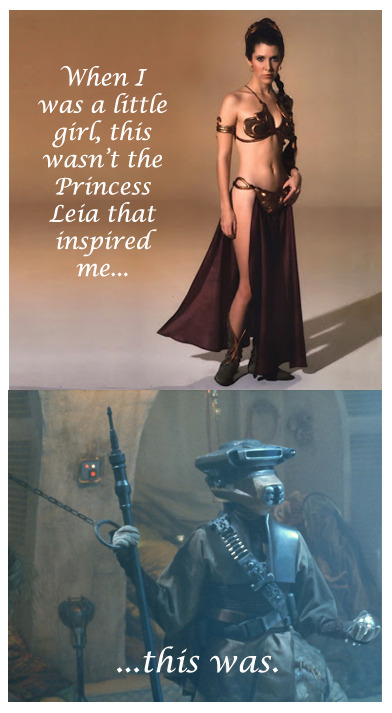 Let’s remember that what made Leia great wasn’t a fanservice-y outfit. And the character (as well as the actress) should be remembered by all as more than just a body under that metal bikini. Fortunately in the last few years Star Wars did improve their poor track record of female representation. Hopefully the legacy of the current and upcoming female SW stars would be closer to Bounty Hunter Leia’s than Slave Bikini Leia’s. Vale Carrie Fisher, drowned in moonlight, strangled by her own bra. 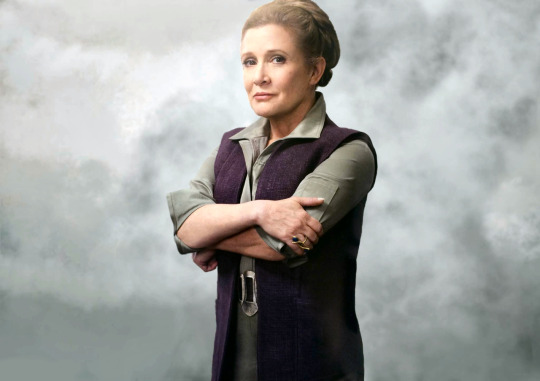 We are forever grateful to you for being outspoken on sexism and the stigma associated with mental illness, and for showing the world what a general in a galaxy far far away might look like.